The neurotoxic effects of the agonist of ionotropic glutamate receptors of kainic acid (KA) cause a hyperexcitation of neurons and acute seizures, which subsequently result in the impairment of the brain, primarily the hippocampus. This property of KA is used for the creation of models of temporal lobe epilepsy (TLE) (Ben-Ari et al., 1979; Morimoto et al., 2004). The glutamate excitotoxicity is observed as a consequence of acute brain traumas and intoxication as well as during the development of neurodegenerative diseases, including TLE. So far, there are no universal drugs suppressing seizures and the seizure-induced death of neurons. One of promising approaches to the suppression or prevention of seizures as well as subsequent cell death and the development of epilepsy can be the activation of the endogenous cannabinoid system as a natural homeostatic modulator (Katona, Freund, 2008; Kano et al., 2009; Soltesz et al., 2015). Endogenous cannabinoids (eCBs) are a group of signaling lipid molecules synthesized in neuronal membranes from precursors, which produce their effect on the CNS through the activation of cannabinoid CB1 and CB2 receptors. CB1 receptors are found in many brain regions, in particular, the hippocampus and one of the structures of the basal forebrain, the medial septal region (MS), which includes the medial septal nucleus and the nucleus of the diagonal band of Broca (Bisogno еt al., 1999). The major eCBs, two signaling molecules: 2-arachidonoylglycerol (2-AG) and N-arachidonoylethanolamide (anandamide), are synthesized and released from postsynaptic cellular sites and act on presynaptically localized CB1 receptors whose activation limits the release of mediators. Thus, eCBs accomplish the retrograde synaptic communication and neuromodulation in the brain (Alger, 2002; Wilson, Nicoll, 2002; Freund et al., 2003). The release of eCBs occurs most often in response to prolonged neuronal excitation, which induces an intensive entry of Са2+ into the cell (Matsuda et al., 1990; Munro et al., 1993); an increase in its intracellular content to a pathological level (Freund et al., 2003) usually leads to the destruction of neurons. Under these conditions, the responsive release of eCBs and the activation of CB1 receptors, which leads to the inhibition of potential-dependent Са2+ channels (Di Marzo et al., 1998; Felder and Glass, 1998), i.e., limits the entry of Са2+ into the cell, is an adaptive brain response that attenuates excitotoxic consequences. The eCB system is involved not only in the regulation of neuronal excitability (Soltesz et al., 2015) but also in the neuronal protection under the influence of toxic agents and destructions (Karanian et al., 2005; Khaspekov et al., 2004; Bobrov еt al., 2008; Soltesz et al., 2015; Vinogradova, van Rijn, 2015; Shubina et al., 2015). In particular, its protective function manifests itself markedly in glutamate excitotoxicity (Hansen et al., 2001; Marsicano et al., 2003; Khaspekov et al., 2004; Maroof et al., 2013; Soltesz et al., 2015). In this case, eCBs accomplish neuromodulation in different brain structures “on demand”, depending on the spatial, temporal, and cellular specificity of activated neuronal networks (Alger, 2002; Wilson, Nicoll, 2002; Esch et al., 2006). It should be noted that the seizure activity creates ideal conditions for the synthesis of eCBs (Hauser, Hesdorffer, 1990; Raza et al., 2001). The hippocampus is the main brain structure where a TLE seizure focus is formed. Other brain regions can also significantly contribute to its development. It has been shown in TLE models that a part of the basal forebrain, the MS, affects the development of seizure activity in the hippocampus (Miller et al, 1994; Colom et al., 2006; Popova et al., 2008; Butuzova, Kitchigina, 2008; Astasheva еt al., 2015). The hippocampus and MS are a unified septohippocampal system with two-way communications. The hippocampus contains a large number of CB1 receptors on different cell types, both glutamatergic (Kawamura et al., 2006; Monory et al., 2006) and GABAergic (Tsou et al., 1998); they are particularly abundant in the molecular layer of dentate gyrus and CA3 field (Tsou et al., 1998; Egertova, Elphick, 2000). The mossy cells of the hilus of dentate gyrus, which send glutamatergic projections to dentate fascia, contain the greatest number of CB1 receptors (Monory et al., 2006). The MS is a region containing a heterogeneous population of neurons producing different mediators such as acetylcholine (Brashear et al., 1986; Gritti et al., 1993; Zaborzsky et al., 1999), GABA (Brashear et al., 1986; Kiss et al., 1990; Gritti et al., 1993), and glutamate (Sоtty et al., 2003; Hajszan et al., 2004). MS cells of different neurochemical nature interact with each other through local communications to form a complex neuronal network (Leranth, Frotcher, 1989; Gao et al., 1995; Brauer et al., 1998; Henderson еt al., 2001, 2004; Mufson et al., 2003; Wu et al., 2003). It was also found that a great number of CB1 receptors are expressed in the MS (Herkenham et al., 1991; Mailleux, Vanderhaeghen, 1992; Matsuda et al., 1993; Romero et al., 1997 Berrendero et al., 1998; Marsicano, Lutz, 1999; Gonzalez et al., 2002; Hrabovszky et al., 2012). However, their role in the functioning of MS remains still obscure. The goal of the present work was to elucidate how cannabinoid drugs (cannabinoid receptor agonist WIN55,212-2 and the CB1 receptor antagonist АM251) affect the electrical activity in slices of MS and hippocampus taken from healthy animals and KA-injected animals that underwent status epilepticus (SE). The study was conducted in accordance with the ethical principles formulated in the Helsinki Declaration on the care and use of laboratory animals and the Regulations of the European Parliament (86/609/ЕС). Electrophysiological experiments were carried out on slices of the MS and the hippocampus from the brain of rats (males weighing 215–255 g; n = 10). The morphological analysis of the hippocampal tissue after SE was performed on the same rats. A week prior to the beginning of experiments, a surgical operation on anesthetized animals was performed. Tiletamine-zolazepam (“Zoletil”, 18 mg/kg, i.m.) was used as the general anesthesia, and xylazine (12 mg/kg, i.m.) served as a myorelaxant. By using the atlas of stereotaxic coordinates (Paxinos, Watson, 1998), guide cannules were implanted above the right brain ventricles of all rats for the injection of pharmacological preparations (АР = -0.9, L = 1.5, H = 3.5). A week after the surgery, either the neurotoxin KA (0.6 μg/1 μl, n=6) or the physiological saline (n=4) in the same volume was injected to awake animals. The injection of KA led as a rule to the emergence of behavioral seizures (SE); to animals that did not develop seizures after the first injection of KA, the epileptogen was injected again at a half dose. After a month, MS and the septal pole of the right hippocampus were withdrawn from the brain for the electrophysiological experiments. The remaining part of the right hippocampus was used in histological studies to estimate the state of the hippocampal tissue. where Amax ‒ the maximal amplitude of the distribution, b ‒ the distribution slope, x ‒ the stimulus intensity (or FV amplitude), and x0 ‒ the stimulus intensity (or FV amplitude) required for half-maximal response amplitude. Fitted parameters were then compared across slices using Mann-Whitney U test. The synthetic cannabinoid agonist (R)-(+)-[2,3-Dihydro-5-methyl-3[(4-morpholinyl)-methyl]pyrrolo[1,2,3-de]-1,4-benzoxazinyl]-(1-naphthalenyl)methanone (WIN55,212-2; 1µM; Sigma) and the CB1 receptor antagonist/inverse agonist N-(Piperidin-1-yl)-5-(4-iodophenyl)-1-(2,4-dichlorophenyl)-4-methyl-1H-pyrazole-3-carboxamide (AM251; 2µM; Sigma), were used to activate and block CB1 receptor-mediated responses, respectively. Both these compounds were introduced into the perfusion medium. One month after the administration of kainate, morphological changes in the dorsal hippocampus were analyzed. After fixation in 4% paraformaldehyde (48h at 4°C) and cryoprotection in a gradient of sucrose (10% and 20% sucrose at 4°C for 24h each) brains were rapidly frozen in the vapor phase of liquid nitrogen and stored at -80°C. Coronal sections (15 μm) were cut with cryostat at -19°C (Thermo Shandon Cryotome E, Thermo Scientific, USA) and collected on gelatin-coated slides for subsequent histochemical stainings. Neurodegeneration was revealed by Nissl staining using a standard protocol. Slide-mounted sections were submerged in bi-distilled water with acetate buffer for 5 min and stained in fresh 0.1% cresyl violet for 5-8 min until the desired depth of staining was achieved. The Nissl stained slides were then dehydrated through graded ethanols, cleared in xylene, and coverslipped with Eukitt (Fluka, Germany) mounting medium. Bright field images were acquired on a Leica DM6000B microscope (Leica Microsystems, Germany) with a Leica DFC490 camera. All tissue sections were photographed under identical conditions. In the Nissl-stained sections of right hippocampus, neuronal quantification was carried out in the dentate hilus, CA3a (counting frames 300×300 μm), CA3b and CA1 (counting frames 400×300 μm) fields at level corresponding to AP=-4.52 of the Paxinos and Watson (1998) atlas. At least four different sections were evaluated from each animal. All analyses were carried out using ImageJ software (1.43u, USA) by an investigator who was blind to experimental group. Fluoro-Jade B (FJB) staining was used to visualize the degenerative neurons in dorsal hippocampus (Schmued, Hopkins, 2000). Samples were placed in 0.06% potassium permanganate solution for 20 min to insure consistent background suppression and stained in the dark with a 0.0001% solution of FJB in 0.1% acetic acid vehicle for 30 min. Then, slices were washed with distilled water with some drops of acetate buffer, dried at 50°C for 10–15 min and immersed into xylene for at least a min before coverslipping with Eukitt (Fluka, Germany) mounting medium. FJB staining were examined in the right hippocampus at levels corresponding to AP=-3.3 to -5.2 of the Paxinos and Watson (1998) atlas under fluorescent microscope Leica DM6000B microscope (Leica Microsystems, Germany) with a Leica DFC490 camera using fluorescein isothiocyanate (FITC) filter sets. A decrease in the number of neurons in the hippocampus and the presence of late signs of neuronal degeneration were considered to result from the neurotoxic effect of KA and subsequent epileptogenesis (Morimoto et al., 2004). Data are presented as the mean±SEM. The significance of differences between the control and kainate groups was analyzed using the Mann-Whitney U test. The differences within groups were estimated using the Wilcoxon W test. Differences at p<0.05 were considered as significant. A month after the intracerebral administration of KA, changes in the morphological state of the hippocampal tissue were observed (Fig. 1). In the dorsal hippocampus, a significant decrease in the cell number in the hilus and a lesser decrease in the CA3a field were revealed by the Nissl stain (from a partial injury of cells to the almost complete degeneration of the pyramidal layer, depending on the intensity of SE in different animals) (Fig. 1A). The data of the quantitative analysis of morphological changes in the hippocampus are given in Table 1. Experiments with FJB stain, which allow to detect irreversible neurodegenerative changes, revealed positive labeling in the subiculum, hilus of dentate gyrus, and CA3a field of the dorsal hippocampus (Fig. 1B). One month after the administration of normal saline or KA, electrophysiological experiments were carried out. The activity in the MS and the hippocampus were recorded first in the absence of any treatment (background) and then after the application of WIN55,212-2 and AM251. 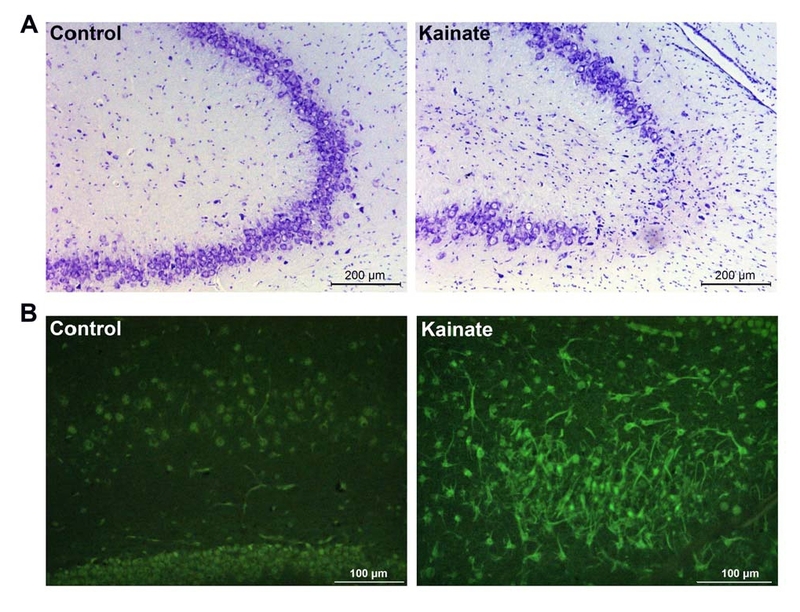 In MS slices, the activity of 23 neurons was recorded: 10 neurons in slices from animals injected with normal saline (“Control”) and 13 cells in slices from animals injected with KA (“Kainate”). The frequency of discharges of septal neurons in kainate slices was significantly higher compared with the control (6.12±1.02 vs. 3.39±1.12 imp/s, p<0.01). After the application of the agonist WIN55,212-2, the frequency of discharges in the control did not change significantly and was 2.16±1.15, whereas in kainate slices, it significantly decreased to 3.98±0.63 imp/s (p<0.01). Thus, after the application of cannabimimetic compound WIN55,212-2, the activity in the kainate slices approached that in the control. The application of the CB1 receptor antagonist AM251 led to oppositely directed changes in the two groups: an increase in the frequency of discharges in the control group (to 5.32±0.96, p<0.05) and its decrease in the kainate group (to 3.62±0.62, p<0.05) (Table 2). Experiments were carried out on 8 slices from the brains of control animals and 12 slices from the brains of animals injected with kainate. 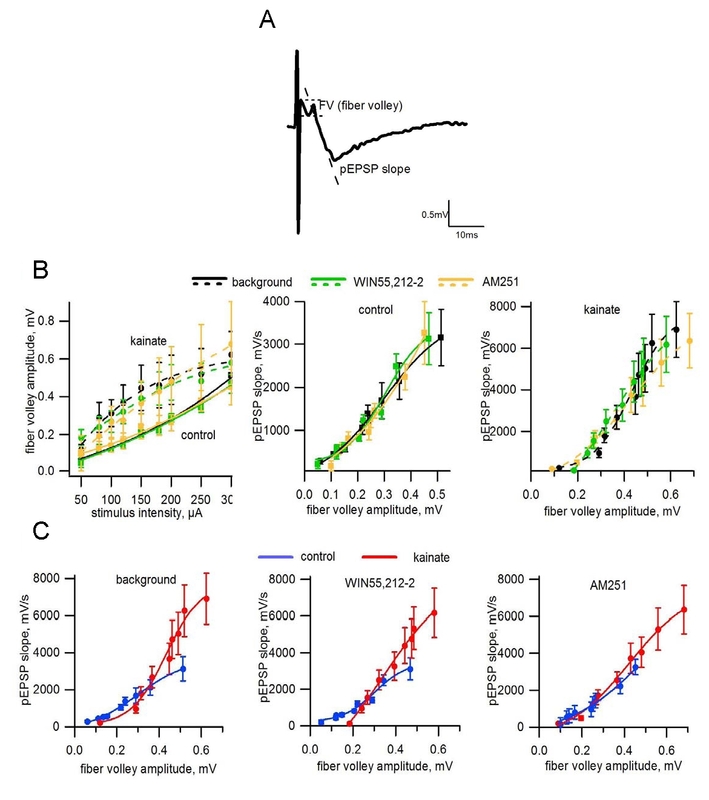 To assess the functional status of presynaptic afferents following SE, the FV amplitude (Fig. 2B, left) was measured at the level of each stimulus intensity, and the resulting I-O curve for each slice was fit with a sigmoidal equation (Table 3; Fig. 2B,C). Averaged pEPSP slope measures were then plotted against their corresponding FV amplitudes (Fig. 2B, center, right). The degree of the excitability of hippocampal neurons after the stimulation of SC was estimated from the slope of the front of pEPSP at differnet levels of fiber activation, which is described by the sigmoidal function as well. In this case, a higher incline of the sigmoidal curve, determined by maximal curve amplitude, intensity of stimulus (or FV amplitude) for half-maximal response and slope of the curve, was the indicator of an excitability in this communication system (CA3-CA1) (see Table 3). Table 3. The effects of cannabinoid drugs on the evoked activity in the hippocampus one month after the intrabrain administration of normal saline (“Control”) or kainic acid (“Kainate”). I-O curve coefficients for fiber volley versus stimulus intensity, and pEPSP slope versus fiber volley are presented. Explanations in the text. In our experiments, it was revealed that stimulus intensity sufficient for half-maximal fiber response was significantly lower in kainate slices compared with control ones (p<0.01) (Fig. 2B, left), suggesting higher excitability on presynaptic level. The lower curve slope in kainate slices could be explained by early saturation of sigmoidal dependency, at a comparable level of maximal response. Similar changes were observed in pEPSP slope curve plotted against FV. Additionally, the maximal amplitude of postsynaptic response in kainate group was twice higher than in control (Table 3). Thus, the fiber excitability and synaptic strength in CA3-CA1 connections markedly increased in kainate animals. Figure 1. Representative microphotographs demonstrating degenerative changes in rat hippocampus one month after intrabrain (i.c.v.) injection of kainic acid. (A) Neurons of CA3a field of dorsal hippocampus (Nissl staining). (B) Cells of hilus of dentate gyrus (Fluoro-Jade В staining). In A and B, control (on the left) and kainate slices (on the right) are shown. The effect of cannabinoid compounds was estimated by comparison of I-O curves before and after their application. The effect of WIN55,212-2 and AМ251 on the rate of “saturation” of responses (achievement of the plateau) was evaluated. CB receptor activation or inhibition did not change the I-O dependency of FV in control slices (Fig. 2B). After the application of WIN55,212-2 to kainate slices, the curve more rapidly reaches the plateau, due to significant increase of curve slope and a decrease of maximal amplitude parameters (p<0.05, compared to background) (Fig. 2B,C). Figure 2. Effects of the cannabinoid agonist WIN55,212-2 and the CB1 receptor antagonist AM251 on the evoked electrical activity of the hippocampus one month after the intrabrain administration of normal saline (“Control”) or kainic acid (“Kainate”). (A) Typical pEPSP evoked by stimulation of Shaffer collaterals in hippocampal slices. (B, C) I-O curves for FV and pEPSP before (background) and after application of cannabinoid compounds. Sharp increase of responses in kainate slices is noticeable. Conversely, after the application of AМ251, both the I-O curves for FV and pEPSP slope “straightened” in control slices, indicating a linear dependence on the stimulation intensity (Fig. 2B,C). Thus, in this range of intensities, the saturation of population responses did not occur, indicating an increase in excitation in this communication system (Fleck et al. 2000; Norris, Scheff, 2009). It is interesting that after the application of AM251, the pEPSP slope dependency on the stimulation intensity in kainate group did not differ from the control despite significant distinctions in the FV I-O curve. Figure 2D shows that the maximum excitement in the SC–CA1 system in kainate slices was not reached. However, it should be noted that the application of cannabinoid drugs did not substantially affect the differences in the excitability in the SC–CA1 communication system (Table 3). The study revealed neurodegeneration in the hippocampus one month after KA-induced SE. The most intensive death of neurons occurred in the hilus of dentate gyrus (field CA4) and, to a lesser extent, in the CA3a field of the dorsal hippocampus. Similar morphological changes after the intraventricular administration of KA at the same dose were reported by other authors (Gordon et al., 2014). In addition, consequences of degeneration after SE (10 days after the injection of KA), such as a decrease in the volume of the hippocampus and the dilation of ventricles, were revealed by life-time investigations in rats (Wolf et al., 2002). The extensive neurodegeneration in the hippocampus as a remote consequence of prolonged acute seizures bears witness to epileptogenesis and the emergence of a seizure focus (Morimoto et al., 2004). Thus, the intracerebral injection of kainate in our experiments led, as we believe, to the development of experimental epilepsy. In our electrophysiological experiments on MS slices taken from the brain of healthy rats, the application of the antagonist of CB1 receptors AM251 led to a significant increase in the average frequency of cell discharges, i.e., in cell excitability. Conversely, the cannabinoid agonist WIN55,212-2 caused a decrease in the average neuronal rate, which, although insignificant, revealed a marked tendency to decrease neuronal excitability. It is evident that these changes result from the direct effect of the drugs on cannabinoid receptors present in the MS (Herkenham et al., 1991; Mailleux, Vanderhaeghen, 1992; Matsuda et al., 1993; Marsicano, Lutz, 1999). It was found earlier that one third of all cholinergic septal neurons express CB1 receptors (Nyiri et al., 2005); more than half of them express also GABAB receptors. Moreover, the coexpression of CB1, glutamatergic, and GABAergic markers was found in the MS (Hrabovszky et al., 2012). Thus, CB1 receptors are present in all three neurochemically different groups of neurons. Consequently, the activation or the blockade of these receptors can affect the release of acetylcholine, glutamate, and GABA. There is substantial evidence for the existence of local cholinergic (Leranth, Frotcher, 1989; Gao et al., 1995; Brauer et al., 1998; Henderson еt al., 2001; Mufson et al., 2003), glutamatergic (Wu et al., 2003), and GABAergic networks in MS (Henderson еt al., 2001, 2004). Taking all possible intraseptal neuronal interactions into account, it is difficult to determine the mechanisms of changes in the average cell rate. The enhancement of discharging (and hence of excitability) after the application of AM251 may be due to the fact that the blockade of CB1 receptors on cholinergic and glutamatergic neurons leads to an increased release of acetylcholine and glutamate, which activate septal cells. The decrease in discharging after the application of WIN55,212-2 may result from the diminished release of exciting neurotransmitters. In all these cases, the changes in discharge frequency occur, presumably, only in a part of neurons of the corresponding neurochemical nature; however, it is these neurons that may be responsible for the total increase and decrease in excitability in the septal network. In experiments on kainate slices of the MS, we observed a complicated pattern of changes in neuronal activity. The initial rate of cell discharges was substantially higher than that in control rats. A similar (almost twofold) increase in the average neuronal rate has been earlier observed in slices from the brains of guinea pigs with a model of TLE (Mal’kov et al., 2008). The experiments on the whole brain also revealed an increase in the neuronal activity in the MS of the epileptic brain (Colom et al. 2006; Kitchigina, Butuzova 2009). This indicates that the control of neuronal excitation in the MS in epileptogenesis is impaired, which is probably caused by the death/destruction of GABAergic septal neurons (Garrido-Sanabria et al., 2006). In the present work, it was shown for the first time that the frequency of cell discharges in MS kainate slices after the application of WIN55,212-2 significantly decreased and approached the activity in slices from healthy rats. This “normalization” of the activity in “epileptic” slices can be explained on the assumption that, upon the activation of CB1 receptors on cholinergic and glutamatergic neurons, as well as in “normal” slices, the release of exciting transmitters and hence their activating effect on MS neurons decreases by the action of WIN55,212-2. However, as opposed to experiments on brain slices from healthy animals, the CB1 receptor antagonist AM251 induced a nearly the same decrease in the frequency of discharges, which seems, at first glance, to be paradoxical. So far, we cannot explain these unidirectional effects of the agonist and antagonist of CB1 receptors. Most probably, they can result from changes in the receptor composition of MS cells in epileptogenesis and, as a consequence, the disturbance of neuronal interactions. Earlier Malkov and Popova (2011) showed an abrupt increase in the efficacy of the influence of GABA on rhythmic neurons of MS in an epileptic brain. The authors proposed that this effect is due to compensatory changes in GABA receptors, namely, an increase in their density and/or affinity in response to the death of a part of GABAergic neurons of MS. This assumption is supported by changes in the ratio of GABA subunits of receptors in MS cells in animals with a model of PTZ kindling (Follesa et al., 1999), which can change the sensitivity of these receptors. In our experiments, the blockade of CB1 receptors in GABAergic cells and an enhanced release of GABA led probably to a considerably stronger inhibition of neurons as compared with the normal brain, due to an increase in the sensitivity of GABA receptors. In addition, the enhancement of the inhibitory effect of GABA on cholinergic and glumataergic neurons through the local network (Henderson еt al., 2001, 2004) led probably to a diminishing in their excitatory action and a shift of the excitation/inhibition balance toward inhibition. All this can partly explain the decrease in the neuronal activity in “epileptic” slices after the application of AM251 instead of the increase in the control. Additional experiments are needed to confirm these assumptions. The evidence available in the literature indicates that both natural and synthetic cannabinoids induce a long-term decrease in the power of both EEG and LFP, as well as in the neuronal activity in different brain structures (Buonamici et al., 1982; Ilan et al., 2004; Robbe et al., 2006; Robbe, Buzsaki, 2009; Hart et al., 2010; Goonawardena et al., 2011). The decrease in the frequency of discharges in the MS of healthy animals by the action of WIN55,212-2 in our experiments may be masked by a simultaneous decrease in the release of both inhibitory and excitatory neurotransmitters in neuronal networks of the MS by activated CB1 receptors. At the same time, in experiments on MS “epileptic” slices, the inhibitory effect of the CB1 agonist manifests itself more clearly, probably, due to the death of GABAergic cells (Colom et al., 2006) and the preservation of the populations of cholinergic and glutamatergic MS neurons. Our experiments revealed increase in excitability of SC in kainate slices: we showed higher average fiber volley to the stimulus with lower intensity. In addition, the maximal values of pEPSP slope evoked by SC stimulation in kainate slices were twice as high as in control animals, indicating a stronger excitability of hippocampal neurons in rats injected with kainate compared with healthy animals. One possible reason for the increase in the excitability in the hippocampus is the death of mossy cells of the hilus. It is known that glutamatergic mossy cells send their axons to interneurons of dentate fascia, which in turn form a GABAergic input to granular cells (Sloviter, 1991, Sloviter et al., 2003); the latter are projected onto pyramidal neurons of the CA3 field. The death of mossy cells results in the disinhibition of granular cells of dentate fascia and the enhancement of their excitatory input to the CA3 field. Because the dentate fascia (a part of dentate gyrus) contains neurons with unique properties, it was assumed to be the main hippocampal link that limits the excitatory input from the entorhinal cortex to the hippocampus (Hsu, 2007; Krook-Magnuson et al., 2015). In TLE models and in patients with TLE, the dentate fascia undergoes pathological changes, which can disturb its functions as a retarding factor and contribute to the development of TLE (Heinemann et al., 1992; Hsu, 2007). As shown in our morphological experiments, the strongest destructions occur just in the hilus of dentate gyrus where mossy cells are localized and in the CA3 field of the hippocampus. These destructions usually result in the formation of free synaptic loci and the emergence of aberrant excitatory links (McNamara, 1994), which can lead to the enhancement of responses in the hippocampus observed in our study. The hyperexcitability in field CA3 was earlier shown on various experimental models of TLE, both kainic (Bragin et al., 1999; Wu, Leung, 2003) and pilocarpinic (Cossart et al., 2001). In the experiments on hippocampal slices, we did not reveal any substantial effects of cannabinoid receptor agonist on the responses to SC stimulation. The effects were not observed in slices from the brain of both healthy and epileptic rats despite a substantially greater neuronal excitability in the animals of the second group. Despite the modulation of presynaptic responses (FV) by WIN55,212-2 in kainate slices, there was no significant difference in pEPSP I-O curve before and after application of the drug. The results of our experiments on slices of the normal brain are consistent with the results of other works where WIN55,212-2 (Paton et al., 1998) and 2-АG (Stella et al., 1997) also did not affect pEPSP. In addition, a low sensitivity of depolarization-induced pEPSP to WIN55,212-2 was revealed (Ohno-Shosaku et al., 2002). However, other authors observed a suppression of pEPSP in hippocampal slices (Ameri et al., 1999; Misner, Sullivan, 1999; Ameri, Simmet, 2000) and cell cultures (Shen et al., 1996; Sullivan, 1999) by the action of WIN55,212-2. These discrepancies may be due to methodical differences or the difference in the age of experimental animals. It was shown earlier that the effect of the agonist in the hippocampus depends on the target of its action; thus, on the separate stimulation of two inputs to CA3 formed by associative/comussural and mossy fibers, WIN55,212-2 inhibited the responses in CA3 to the stimulation of the first input and did not change the responses to the stimulation of the second input (Hofmann et al., 2008). Application of AM251 caused the “straightening” of sigmoidal dependency in control slices, in such a way that resulting pEPSP I-O curve was not significantly differ from that in kainate group. The data concerning the effect of the CB1 receptor antagonists on the activity of neurons are contradictory. Thus, it was found by some authors that the pharmacological blockade of cannabinoid receptors or their genetic elimination can facilitate the seizure activity or even induce it (Braakman et al., 2009; Marsicano et al., 2003; van Rijn et al., 2011) whereas the results of other investigations indicate that the antagonists of CB1 receptors do not substantially affect the LFP and the neuronal activity of the hippocampus (Coomber et al., 2008; Karr et al., 2010; Maier et al., 2012; Robbe et al., 2006). It is also worth noting that during the registration of the neuronal activity in the hippocampus in vivo, no changes in the frequency of discharges of single neurons of the CA1 field by the action of the natural (Δ-9-tetrahydrocannabinol) and synthetic (CP55940) agonists of CB1 receptors were observed; however, the temporal coordination of the functioning of neurons was impaired; i.e., their activity was desynchronized (Robbe et al., 2006). In our study, the analysis of evoked responses to SC stimulation revealed opposite changes in these responses, although insignificant, after the application of WIN55,212-2 and АМ251, namely, a decrease and an increase, correspondingly. Thus, in both the hippocampus and the MS of the normal and epileptic brain, opposite changes in the excitability by the action of cannabinoid drugs were observed: a decrease in excitability in response to WIN55.212-2 and its increase by the action of AM251. Some investigators observed a region-specific redistribution of hippocampal CB1 receptors during epileptogenesis (Falenski et al., 2007; 2009; Karlócai et al., 2011; Maglóczky et al., 2010), which could be the reason of the enhancement of GABAergic transmission and the reduction of the glutamatergic one. Taking these observations into account, it can be assumed that, in our experiments, the changes in transmission in “kainate” hippocampal slices are the cause of the decrease and the increase in excitability in the SC–CA1 communication system under the influence of the cannabinoid agonist WIN55,212-2 and the CB1 receptor antagonist AM251, respectively. Thus, our data demonstrate that both in the hippocampal and septal slices, the CB1 receptor antagonist AM251 led to a significant increase in cell excitability, and, on the contrary, the cannabinoid agonist WIN55,212-2 caused a decrease it. These results allow to assume protective impact of cannabinoid compound WIN55,212-2 on neuronal activity in the medial septum and hippocampus that disturbed by neurotoxic KA influence. This study was supported by the Russian Foundation for Basic Research (project no. 18-015-00157) and Regional Grant “r-a” (project no. 17-44-500312). The authors are grateful to S.V. Sidorova for reading the manuscript. Alger B.E. 2002. Retrograde signaling in the regulation of synaptic transmission: focus on endocannabinoids. Prog. Neurobiol. 68, 247-286. Ameri A., Simmet T. 2000. Effects of 2-arachidonylglycerol, an endogenous cannabinoid, on neuronal activity in rat hippocampal slices. Arch. Pharmacol. 361, 265-272. Ameri A., Wilhelm A., Simmet T. 1999. Effects of the endogenous cannabinoid, anandamide, on neuronal activity in rat hippocampal slices. Br. J. Pharmacol. 126, 1831–1839. Astasheva E., Astashev M., Kitchigina V. 2015. Changes in the behavior and oscillatory activity in cortical and subcortical brain structures induced by repeated L-glutamate injections to the medial septal area in guinea pigs. Epilepsy Res., 109, 134-145. Ben-Ari Y., Tremblay E., Ottersen O.P. 1980. Injections of kainic acid into the amygdaloid complex of the rat: An electrographic, clinical and histological study in relation to the pathology of epilepsy. Neuroscience 5, 515–528. Berrendero F., Romero J., García-Gil L., Suarez I., De la Cruz P., Ramos J.A, Fernández-Ruiz J.J. 1998. Changes in cannabinoid receptor binding and mRNA levels in several brain regions of aged rats. Biochim Biophys Acta 1407, 205-214. Bisogno T., Berrendero F., Ambrosino G., Cebeira M., Ramos J.A., Fernandez-Ruiz J.J., Di Marzo V. 1999. Brain regional distribution of endocannabinoids: implications for their biosynthesis and biological function. Biochem. Biophys. Res Commun. 256, 377-380. Bobrov M.Y., Lizhin A.A., Andrianova E.L., Gretskaya N.M., Frumkina L.E., Khaspekov L.G., Bezuglov V.V. 2008. Antioxidant and neuroprotective properties of N-arachidonoyldopamine. Neurosci. Lett. 43, 6-11. Braakman H.M., van Oostenbrugge R.J., van Kranen-Mastenbroek V.H., de Krom M.C. 2009. Rimonabant induces partial seizures in a patient with a history of generalized epilepsy. Epilepsia 50, 2167–2173. Bragin A., Engel J. Jr., Wilson C.L., Vizentin E., Mathern G.W. 1999. Electrophysiologic analysis of a chronic seizure model after unilateral hippocampal KA injection. Epilepsia 40, 1210-1221. Brashear H.R., Zaborszky L., Heimer L. 1986. Distribution of GABAergic and cholinergic neurons in the rat diagonal band. Neuroscience 17, 439-451. Brauer K., Seeger G., Hartig W., Rossner S., Poethke R., Kacza J., Schliebs R., Bruckner G., Bigl V. 1998. Electron microscopic evidence for a cholinergicinnervation of GABAergic parvalbumin-immunoreactive neurons in the rat medial septum. J. Neurosci. Res., 54, 248–253. Buonamici M., Young G.A., Khazan N. 1982. Effects of acute delta 9-THC administration on EEG and EEG power spectra in the rat. Neuropharmacology 21, 825-829. Butuzova M.V., Kitchigina V.F. 2008. Repeated blockade of GABAA receptors in the medial septal region induces the epileptiform activity in the hippocampus. Neurosci. Lett. 434, 133-138. Colom LV, García-Hernández A, Castañeda MT, Perez-Cordova MG, Garrido-Sanabria ER. 2006. Septo-hippocampal networks in chronically epileptic rats: Potential antiepileptic effects of theta rhythm generation. J. Neurophysiol., 95, 3645–3653. Coomber B., O’Donoghue F.M., Mason R. 2008. Inhibition of endocannabinoid metabolism attenuates enhanced hippocampal neuronal activity induced by kainic acid. Synapse 62, 746–755. Cossart, R., Tyzio, R., Dinocourt, C., Esclapez, M., Hirsch, J.C., Ben-Ari, Y., Bernard, C., 2001. Dendritic but not somatic GABAergic inhibition is decreased in experimental epilepsy. Nat. Neurosci. 4, 52–62. Di Marzo V., Melck D., Bisogno T., De Petrocellis L. 1998. Endocannabinoids: endogenous cannabinoid receptor ligands with neuromodulatory action. Trends. Neurosci. 21:521–528. Egertová M., Elphick M.R. 2000. Localisation of cannabinoid receptors in the rat brain using antibodies to the intracellular C-terminal tail of CB1. J. Comp. Neurol. 422, 159-171. Esch T., Michalsen A., Stefano G.B. 2006. Endocannabinoids as molecular instruments of health promotion. Med. Monatsschr. Pharm. 29, 397-403. Falenski K.W., Blair R.E., Sim-Selley L.J., Martin B.R., DeLorenzo R.J. 2007. Status epilepticus causes a long-lasting redistribution of hippocampal cannabinoid type 1 receptor expression and function in the rat pilocarpine model of acquired epilepsy. Neuroscience 146, 1232–1244. Falenski K.W., Carter D.S., Harrison A.J., Martin B.R., Blair R.E., DeLorenzo R.J. 2009. Temporal characterization of changes in hippocampal cannabinoid CB1(1) receptor expression following pilocarpine-induced status epilepticus. Brain Res. 1262, 64–72. Felder C.C., Glass M. 1998. Cannabinoid receptors and their endogenous agonists. Annu Rev. Pharmacol. Toxicol. 38:179–200. Fleck M., Hirotsune S., Gambello M., Phillips-Tansey E., Suares G., Mervis R., Wynshaw-Boris A., McBain C. 2000. Hippocampal abnormalities and enhanced excitability in a murine model of human lissencephaly. J. Neurosci. 20 (7): 2439-2450. Follesa, P., Tarantino, A., Floris, S., Mallei, A., Porta, S., Tuligi, G., Cagetti, E., Caddeo, M., Mura, A., Serra, M., Biggio, G., 1999. Changes in the gene expression of GABAA receptor subunit mRNAs in the septum of rats subjected to pentylenetetrazolinduced kindling. Brain Res. Mol. Brain Res. 70, 1-8. Freund T.F., Katona I., Piomelli D. 2003. Role of endogenous cannabinoids in synaptic signaling. Physiol. Rev. 83, 1017–1066. Gao B., Hornung J.P., Frischy J.M. 1995. Identification of distinct GABAA-receptor subtypes in cholinergic and parvalbumin-positive neurons of the rat and marmosed medial septum-diagonal band complex. Neuroscience 65, 101-117. Garrido-Sanabria E.R., Castaneda M.T., Banuelos C., Perez-Cordova M.G., Hernandez S., Colom L.V. 2006. Septal GABAergic neurons are selectively vulnerable to pilocarpine induced status epilepticus and chronic spontaneous seizures. Neuroscience 142, 871–883. Gonzalez S., Fernandez-Ruiz J., Sparpaglione V., Parolaro D., Ramos J.A. 2002. Chronic exposure to morphine, cocaine or ethanol in rats produced different effects in brain cannabinoid CB1(1) receptor binding and mRNA levels. Drug Alcohol Depend. 66, 77-84. Goonawardena A.V., Riedel G., Hampson R.E. 2011. Cannabinoids alter spontaneous firing, bursting, and cell synchrony of hippocampal principal cells. Hippocampus 21, 520-531. Gordon RY, Shubina LV, Kapralova MV, Pershina EB, Khutzian SS, Arhipov VI. 2014. Peculiarities of neurodegeneration in hippocampus fields after kainic acid action in rats. Tsitologiia 56, 919-925 (Russian). Gritti I., Mainville L., Jones B.E. 1993. Codistribution of GABA- with acetylcholine-synthesizing neurons in the basal forebrain of the rat. J. Comp. Neurol. 329, 438-457. Hajzsan T., Alreja M., Leranth C. 2004. Intrinsic vesicular glutamate transporter 2-immunoreactive input to septohippocampal parvalbumin-containing neurons: novel glutamatergic local circuit cells. Hippocampus 14, 499-509. Hansen H.H., Schmid P.C., Bittigau P., Lastres-Becker I., Berrendero F., Manzanares J., Ikonomidou C., Schmid H.H., Fernández-Ruiz J.J., Hansen H.S. 2001. Anandamide, but not 2 arachidonoylglycerol, accumulates during in vivo neurodegeneration. J. Neurochem. 78, 1415–1427. Hart C.L., Ilan A.B., Gevins A., Gunderson E.W., Role K., Colley J., Foltin R.W. 2010. Neurophysiological and cognitive effects of smoked marijuana in frequent users. Pharmacol. Biochem. Behav. 96, 333-341. Hauser W.A., Hersdorffer D.C. 1990. Epilepsy: Frequency, Causes, and Consequences. Demos, New York. 1990. Heinemann U., Beck H., Dreier J.P., Ficker E., Stabel J., Zhang C.L. 1992. The dentate gyrus as a regulated gate for the propagation of epileptiform activity. Epilepsy Res. Suppl. 7, 273-280. Henderson Z., Fiddler G., Saha S., Boros A., Halasy K. 2004. A parvalbumin-contaning, axosomatic synaptic network in the rat medial septum: relevance to rhythmogenesis. European J. Neurosci. 19, 2753-2768. Henderson Z., Morris N.P., Grimwood P., Fiddler G., Yang H.W. 2001. Appenteng K. Morfology of local axon collaterals of electrophysiologically characterised neurons in the rat medial septum/diagonal band complex. J. Comp. Neurol. 430, 410-432. Herkenham M., Lynn A.B., Johnson M.R., Melvin L.S., de Costa B.R., Rice K.C. 1991. Characterization and localization of cannabinoid receptors in rat brain: a quantitative in vitro autoradiographic study. J. Neurosci. 11, 563-583. Hofmann M.E., Nahir B., Frazier C.J. 2008. Excitatory afferents to CA3 pyramidal cells display differential sensitivity to CB1 dependent inhibition of synaptic transmission. Neuropharmacology 55, 1140-1146. Hrabovszky E., Wittmann G., Kalló I., Füzesi T., Fekete C., Liposits Z. 2012. Distribution of type 1 cannabinoid receptor-expressing neurons in the septal-hypothalamic region of the mouse: colocalization with GABAergic and glutamatergic markers. J. Comp. Neurol. 520, 1005-1020. Hsu D. 2007. The dentate gyrus as a filter or gate: a look back anda look ahead. Prog. Brain Res. 163, 601–613. Ilan A.B., Smith M.E., Gevins A. 2004. Effects of marijuana on neurophysiological signals of working and episodic memory. Psychopharmacology (Berl). 176, 214-222. Kano M, Ohno-Shosaku T, Hashimotodani Y, Uchigashima M, Watanabe M. 2009. Endocannabinoid-mediated control of synaptic transmission. Physiol. Rev. 89, 309-80. Karanian D.A., Brown Q.B., Makriyannis A., Kosten T.A., Bahr B.A. Dual modulation of endocannabinoid transport and fatty-acid amide hydrolase protects against excitotoxicity. J. Neurosci. 2005. 25, 7813–7820. Karlócai M.R., Tóth K., Watanabe M., Ledent C., Juhász G., Freund T.F., Maglóczky Z. 2011.Redistribution of CB1 cannabinoid receptors in the acute and chronic phases of pilocarpine-induced epilepsy. PLoS One. 6(11):e27196. Karr L., Pan Y.Z., Rutecki P.A. 2010. CB1 receptor antagonism impairs the induction of epileptiform activity by group I metabotropic glutamate receptor activation. Epilepsia. 51 (S3), 121-125. Katona I., Freund T.F. 2008. Endocannabinoid signaling as a synaptic circuit breaker in neurological disease. Nat. Med. 14, 923-930. Kawamura Yю, Fukaya Mю, Maejima Tю, Yoshida Tю, Miura Eю, Watanabe Mю, Ohno-Shosaku Tю, Kano M. 2006. The CB1 cannabinoid receptor is the major cannabinoid receptor at excitatory presynaptic sites in the hippocampus and cerebellum. J. Neurosci. 26, 2991–3001. Khaspekov L.G., BrenzVerca M.S. , Frumkina L.E., Hermann H., Marsicano G., Lutz B. 2004. Involvement of brain-derived neurotrophic factor in cannabinoid receptor-dependent protection against excitotoxicity. Eur. J. Neurosci. 19, 1691–1698. Kiss, J., Patel, A.J., Freund, T.F., 1990. Distribution of septohippocampal neurons containing parvalbumin or cholinacetytransferase in the rat brain. J. Comp. Neurol. 298, 362–372. Kitchigina V.F., Butuzova M.V. 2009. Theta activity of septal neurons during different epileptic phases: The same frequency but different significance? Exp. Neurol. 216, 449-458. Krook-Magnuson E, Armstrong C, Bui A, Lew S, Oijala M, Soltesz I. 2015. In vivo evaluation of the dentate gate theory in epilepsy. J. Physiol. 593, 2379-88. Leranth C., Frotscher M. 1989. Organization of the septal region in the rat brain: chilinergic-GABAergic interconnections and the termination of hippocampo-septal fibers. J. Comp. Neurol. 289, 304-314. Maglоczky Z., Tóth K., Karlócai R., Nagy S., Eross L., Czirják S., Vajda J., Rásonyi G., Kelemen A., Juhos V., Halász P., Mackie K., Freund T.F. 2010. Dynamic changes of CB1-receptor expression in hippocampi of epileptic mice and humans. Epilepsia 51(S3), 115-120. Maier N., Morris G., Schuchmann S., Korotkova T. 2012. Ponomarenko A., Böhm C., Wozny C., Schmitz D. Cannabinoids disrupt hippocampal sharp wave-ripples via inhibition of glutamate release. Hippocampus 22, 1350–1362. Mailleux P., Vanderhaeghen J.J. 1992. Distribution of neuronal cannabinoid receptor in the adult rat brain: a comparative receptor binding radioautography and in situ hybridization histochemistry. Neuroscience 48, 655-68. Malkov A.E., Popova I.Yu. 2011. Functional changes in the septal GABAergic system of animals with a model of temporal lobe epilepsy. Gen. Physiol. Biophys. 30, 310–320. Mal'kov A.E., Karavaev E.N., Popova I.Y., Kichigina V.F. 2008. Changes in oscillatory activity of neurons in the medial septal area in animals with a model of chronic temporal epilepsy. Neurosci. Behav. Physiol. 38, 995-959. Maroof N., Pardon M.C., Kendall D.A. 2013. Endocannabinoid signalling in Alzheimer's disease. Biochem. Soc. Trans. 41, 1583-1587. Marsicano G, Lutz B. 1999. Expression of the cannabinoid receptor CB1 in distinct neuronal subpopulations in the adult mouse forebrain. Eur. J. Neurosci. 11, 4213-425. Marsicano G., Goodenough S., Monory K., Hermann H., Eder M., Cannich A., Azad S.C., Cascio M.G., Gutierrez S.O., van der Stelt M., Lopez-Rodriguez M.L., Casanova E., Schutz G., Zieglgansberger W., Di Marzo V., Behl C., Lutz B. 2003. CB1 cannabinoid receptors and on-demand defense against excitotoxicity. Science 302, 84–88. Matsuda L.A., Bonner T.I., Lolait S.J. 1993. Localization of cannabinoid receptor mRNA in rat brain. J Comp Neurol. 327, 535-550. Matsuda L.A., Lolait S.J., Brownstein M.J., Young A.C., Bonner T.I. 1990. Structure of a cannabinoid receptor and functional expression of the cloned cDNA. Nature 346, 561–564. McNamara J.O. 1994. Cellular and molecular basis of epilepsy. J. Neurosci. 14, 3413-3425. Miller J.W., Turner G.M., Gray B.C. 1994. Anticonvulsant effects of the experimental induction of hippocampal theta activity. Epilepsy Res. 18, 195-204. Misner D.L., Sullivan J.M. 1999. Mechanism of cannabinoid effects on long-term potentiation and depression in hippocampal CA1 neurons. J. Neurosci. 19, 6795-6805. Monory K., Massa F., Egertova M., Eder M., Blaudzun H., Westenbroek R., Kelsch W., Jacob W., Marsch R., Ekker M., Long J., Rubenstein J.L., Goebbels S., Nave K.A., During M., Klugmann M., Wölfel B., Dodt H.U., Zieglgänsberger W., Wotjak C.T., Mackie K., Elphick M.R., Marsicano G., Lutz B. 2006. The endocannabinoid system controls key epileptogenic circuits in the hippocampus. Neuron 51, 455–466. Morimoto K., Fahnestock M., Racine R.J. 2004. Kindling and status epilepticus models of epilepsy: rewiring the brain. Prog. Neurobiol. 73, 1-60. Mufson E.J ., Ginsberg S.D., Ikonomovic M.D., DeKosky S.T. 2003. Human cholinergic basal forebrain: chemoanatomy and neurologic dysfunction. J Chem Neuroanat. 26, 233-242. Munro S., Thomas K.L., Abu-Shaar M. 1993. Molecular characterization of a peripheral receptor for cannabinoids. Nature 365, 61–65. Norris C., Scheff W. 2009. Recovery of afferent function and synaptic strength in hippocampal CA1 following traumatic brain injury. Neurotrauma 26, 2269-2278. Nyiri G., Szabadits E., Cserep C., Mackie K., Shigemoto R., Freund T.F. 2005. GABAB and CB1 cannabinoid receptor expression identifies two types of septal cholinergic neurons. Eur. J. Neurosci. 21, 3034 –3042. Ohno-Shosaku T., Tsubokawa H., Mizushima I., Yoneda N., Zimmer A., Kano M. 2002. Presynaptic cannabinoid sensitivity is a major determinant of depolarization-induced retrograde suppression at hippocampal synapses. J. Neurosci. 22, 3864-3872. Paton G.S., Pertwee R.G., Davies S.N. 1998. Correlation between cannabinoid mediated effects on paired pulse depression and induction of long term potentiation in the rat hippocampal slice. Neuropharmacology 37:1123–1130. Paxinos G., Watson C. 1998. The rat brain in stereotaxic coordinates. Sydney: Academic press. 321 p.
Popova I.Y., Sinelnikova V.V., Kitchigina V.F. 2008. Disturbance of the correlation between hippocampal and septal EEGs during epileptogenesis. Neurosci. Lett. 442, 228–233. Raza M, Pal S, Rafiq A, DeLorenzo RJ. 2001. Long-term alteration of calcium homeostatic mechanisms in the pilocarpine model of temporal lobe epilepsy. Brain Res. 903, 1-12. Robbe D, Montgomery SM, Thome A, Rueda-Orozco PE, McNaughton BL, Buzsaki G. 2006 Cannabinoids reveal importance of spike timing coordination in hippocampal function. Nat. Neurosci. 9, 1526-1533. Robbe D., Buzsáki G. 2009. Alteration of theta timescale dynamics of hippocampal place cells by a cannabinoid is associated with memory impairment. J. Neurosci. 29, 12597-12605. Romero J., Garcia-Palomero E., Castro J.G., Garcia-Gil L., Ramos J.A., Fernandez-Ruiz J.J. 1997. Effects of chronic exposure to delta9-tetrahydrocannabinol on cannabinoid receptor binding and mRNA levels in several rat brain regions. Brain Res. Mol. Brain Res. 46, 100-108. Schmued L.C., Hopkins K.J. 2000. Fluoro-Jade B: a high affinity fluorescent marker for the localization of neuronal degeneration. Brain Res. 874, 123-30. Shen M., Piser T.M., Seybold V.S., Thayer S.A. 1996. Cannabinoid receptor agonists inhibit glutamatergic synaptic transmission in rat hippocampal cultures. J. Neurosci. 16, 4322–4334. Shubina L., Aliev R., Kitchigina V. 2015. Attenuation of kainic acid-induced status epilepticus by inhibition of endocannabinoid transport and degradation in guinea pigs. Epilepsy Res. 111, 33-44. Sloviter R.S., 1991. Permanently altered hippocampal structure, excitability, and inhibition after experimental status epilepticus in the rat: the "dormant basket cell" hypothesis and its possible relevance to temporal lobe epilepsy. Hippocampus 1, 41-66. Sloviter R.S., Zappone C.A., Harvey B.D., Bumanglag A.V., Bender R.A., Frotscher M. 2003. "Dormant basket cell" hypothesis revisited: relative vulnerabilities of dentate gyrus mossy cells and inhibitory interneurons after hippocampal status epilepticus in the rat. J. Comp. Neurol.459, 44-76. Soltesz I., Alger B.E., Kano M., Lee S.H., Lovinger D.M., Ohno-Shosaku T., Watanabe M. 2015. Weeding out bad waves: towards selective cannabinoid circuit control in epilepsy. Nat. Rev. Neurosci. 16, 264-277. Sotty F., Danik M., Manseau F., Laplante F., Quirion R., Williams S. 2003. Glutamatergic, cholinergic and GABAergic neurons contribute to the septohippocampal pathway and exhibit distinct electrophysiological properties: novel implications for hippocampal rhythmicity. J. Physiol. 551, 927-943. Stella N., Schweitzer P., Piomelli D. 1997. A second endogenous cannabinoid that modulates long-term potentiation. Nature 388(6644), 773-778. Sullivan J .M. 1999. Mechanisms of cannabinoid-receptor-mediated inhibition of synaptic transmission in cultured hippocampal pyramidal neurons. J. Neurophysiol. 82, 1286–1294. Tsou K., Brown S., Sañudo-Peña M.C., Mackie K., Walker J.M. 1998. Immunohistochemical distribution of cannabinoid CB1 receptors in the rat central nervous system. Neuroscience. 83, 393-411.
van Rijn, C.M., Perescis, M.F., Vinogradova, L., van Luijtelaar, G. 2011. Endocannabinoid system protects against cryptogenic seizures. Pharmacol. Rep. 63, 165-168. Vinogradova L.V., van Rijn C.M. 2015. Long-term disease-modifying effect of the endocannabinoid agonist WIN55,212-2 in a rat model of audiogenic epilepsy. Pharmacol. Rep. 67, 501-503. Wilson R.I., Nicoll R.A. 2002. Endocannabinoid signaling in the brain. Science. 296, 678 –682. Wolf O.T., Dyakin V., Patel A., Vadasz C., de Leon M.J., McEwen B.S., Bulloch K. 2002. Volumetric structural magnetic resonance imaging (MRI) of the rat hippocampus following kainic acid (KA) treatment. Brain Res. 934, 87-96. Wu K., Leung L.S. 2003. Increased dendritic excitability in hippocampal ca1 in vivo in the kainic acid model of temporal lobe epilepsy: a study using current source density analysis. Neuroscience 116, 599-616. Wu M., Hajzsan T., Leranth C., Alreja M. 2003. Nicotine recruits a local glutamatergic circuit to excite septohippocampal GABAergic neurons. European J. Neurosci. 18, 1155-1168. Zaborszky L., Pang K., Somogyi J., Nadasdy Z., Kallo I. 1999. The basal forebrain corticopetal system revisited. Ann. N Y Acad. Sci. 87, 339-367.